One each from Maryland and Oklahoma. Two each from Kentucky and Texas. Six each from Arkansas and Missouri. Seventeen from Mississippi, and another 17 from Tennessee. And 11 that are identified simply as United States — because they cross state lines. More than 100 in total… and they are pure genealogical gold. Because there’s almost nothing better for genealogical research than historical maps. Free. Digitized. Online to peruse at 3 a.m.
And this collection — of Confederate War Maps digitized and put online by the National Archives — is about as good as it gets. The digitized maps were captured by or surrendered to the United States at the conclusion of the Civil War, or were later donated by former Confederate leaders, and show well known — and lesser-known — battlefields, fortifications, fort plans and more. Check out the link Confederate Maps, or — for the state-by-state maps — check out this list of RG 109 maps by state. And, of course, remember that NARA isn’t the only source for Civil War maps — not by a long shot. 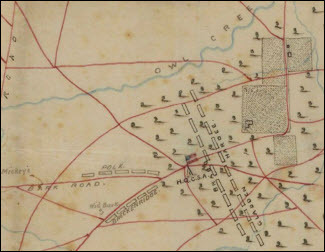 One of the most comprehensive collections of Civil War maps is at the Library of Congress, where more than 2,300 items have been digitized and put online in its Civil War Maps collection. • Images from US Civil War and Civil War Maps, the David Rumsey Map Collection. • The American Civil War collection, United States Military Academy at West Point, and its Civil War Maps in Special Collections. Excellent! Glad you found the post helpful! So cool! Thank you Judy. Were you not wearing your bunny slippers this 3am? Ooh ! Ooh! Maps! My favorite thing (almost)! One of my best genealogical experiences was finding the perfect map large scale map of the neighborhood where my 3xggrandfather lived in the archives in Nova Scotia and ordering a copy. As the archivist flipped it over to put it face down on the platen, we noticed an inscription on the back, signed by the surveyor who had made the map for ….. Yup! ….. there was ggggrandpa’s name. The archivist was stunned, and I gladly paid extra for a copy of that flip side.